You can visit the Tanzquartier, a fantastic dance center; the Designforum Wien, focused on design and its contemporary function; monochrome, an art-technology-philosophy group, publishing house, and film production company; the incredible ZOOM Children’s Museum; and the MQ Point, a museum shop with brilliant designs and unconventional gifts. And there’s more! 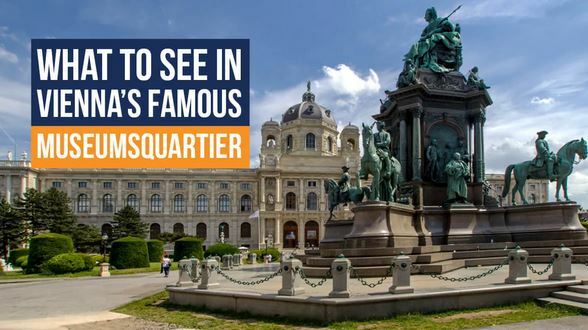 Here are other famous MQ attractions. This is one of the city’s most-visited museums, and rightfully so. Its collection of about 6,000 works of Austrian art of the second half of the 19th century and modern times is one of the world’s most important collections. It all started with Elisabeth and Rudolf Leopold who collected hundreds of masterpieces of Austrian modern art, particularly Viennese art nouveau, the Vienna Workshop, and the Expressionist period. The Leopold Museum is home to the world’s largest Egon Schiele collection, and to the masterworks by Gustav Klimt, the founder of the Vienna Secession movement, among other brilliant artists. The mumok – Museum of Modern Art showcases art from the 20th and 21st centuries, focusing on Pop Art and Photorealism, Fluxus and Nouveau Réalisme, and Viennese Actionism. The museum’s collection consists of around 9,000 works. These include paintings, sculptures, installations, drawings, graphics, photos, videos, films, architectural models, and furniture. Mumok is home to unique works by famous artists, such as Andy Warhol, Claes Oldenburg, Robert Rauschenberg, Jasper Johns, Yoko Ono, Daniel Spoerri, Nam June Paik, George Brecht, Marcel Duchamp, Gerhard Richter, Günter Brus, Otto Muehl, Hermann Nitsch, and Rudolf Schwarzkogler. Some leading works of the Classical Modern are also represented, including art by Pablo Picasso, Paul Klee, and Piet Mondrian. Kunsthalle Wien is a special place that art-lovers shouldn’t miss. Housed in the former Baroque winter riding hall, it presents an exceptionally high standard of contemporary art and focuses on presentations of contemporary and modern art. Here you’ll find a great variety of international contemporary art and applied contemporary discourses, which is why Kunsthalle Wien is constantly working on innovative exhibition and communication formats. You’ll find a glass cube by Adolf Krischanitz at the outdoor site, which presents art as if in a display window. Also available is the lovely café with a gigantic terrace on the glass pavilion. Opened in 1993, the Architecture Center Vienna is one of Austria’s most unique and most successful architecture centers, renowned across the world as an information, knowledge, and research hub. Its collection is famous worldwide, as the Center conveys the latest international achievements to the public, while critically examining the national history of architecture of the 20th and 21st centuries. At the site and online, the Architecture Center provides a professional service for everybody who is interested in architecture. The MuseumsQuartier is also home to the phenomenal Q21 – an area of 7000 m² and the workplace of about fifty associations, initiatives, agencies, and editorial offices in the culture sector, the basis of which is creation. The Q21 tenants work independently in a truly wide variety of fields, from various international festivals and literature to indie game development and fashion, and much more. Its artist-in-residence program is run together with tranzit.org / ERSTE Stiftung, the Federal Ministry for Europe, Integration and Foreign Affairs, and the Research Institute for Arts and Technology, which invite international guest artists to live and work on their projects in the MQ’s studios. Some of these projects are showcased in the MQ’s exhibition spaces, such as the phenomenal frei_raum Q21. It’s often possible to visit an artist in their studio on a guided tour of the MQ/Q21. The MQ’s beautiful public courtyards host dance, art, film, and literary performances, and these courtyards are connected by stunning Baroque passageways that merge old architecture with modern art. They serve as free outdoor exhibitions or mini-museums, featuring the changing artwork, the many educational and informational pamphlets and maps, as well as the vending machines that offer publications to support the artists and their work. Each passage has a theme corresponding to a different discipline of contemporary art. These are: LITERATURpassage , TONSPUR_passage, KABINETT comic passage, STREET ART PASSAGE VIENNA, Typopassage Wien, Meteoritenpassage, Brückenpassage, and Sternenpassage. Another MQ trademark is the Enzi (aka Enzo, or the Vienna model) – the famous, modern, outdoor lounge furniture, the color of which is usually decided by a public online vote. The MuseumsQuartier is a popular place to hang out, and you’ll see many people relaxing, chatting, listening to music, reading a book, or working on their laptops on this colorful seating in the inner courtyard. In 2005, the Enzi was awarded the Adolf Loos National Prize for Design, and it also regularly travels throughout Europe.